This Yugo style underfolding receiver has a lightening cut only on right side, double locking stock pattern, and top cover locking pin holes. 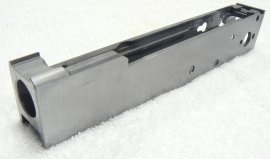 It is machined from solid 4140 billet steel and heat treated to precise specs. 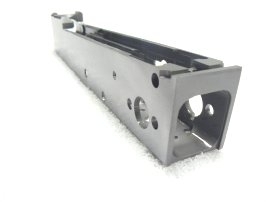 This price includes a finished receiver that is heat treated and ready to assemble. 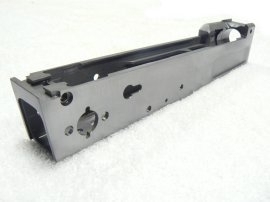 No bullet guide, selector stop, grip nut, cover plates, special markings or other components are added. All of these components can be purchased individually from this website (cncwarrior.com). 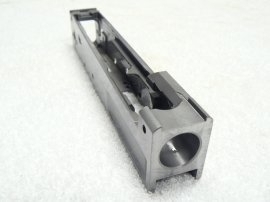 Just to be clear: we are primarily a manufacturer of machined components. Not gunsmiths or custom gun builders. We do not offer assembly services.